Last month, Penn State issued a call to artists to submit designs for a statue should reflect Penn State’s principle of increasing 'diversity and inclusion.’ My submission is in cartoon form. It’s the same on college campuses. Rather than discuss ideas in a forum conducive to healthy debate, universities have abandoned logic, reason and evidence in favor of preserving the feelings of their diverse students. Instead of higher learning, we have a narrower channel of free speech. Certain words must not be used. Adherence to the politically correct narrative must be followed. It’s cultural Marxism at its worst. Fifty years ago, there were far more conservative professors at universities. Now, the vast majority of them are far far left purveyors of Cultural Marxism. It’s no wonder that they allow conservatives to be driven off campus or physically assaulted. The free speech movement began at Berkeley and it also died there. Meanwhile, universities are charging students an absurd amount of money. Too many are enslaved by the resulting debt and it follows them for the rest of their lives. White males are passed over for women and minorities when it comes to the well-paying jobs. Many of students are forced to live with their parents. It’s time for young people to revolt and STOP going to college. There are ways for you to succeed on your own without participating in the university debt machine that results in impoverishment and mind control. 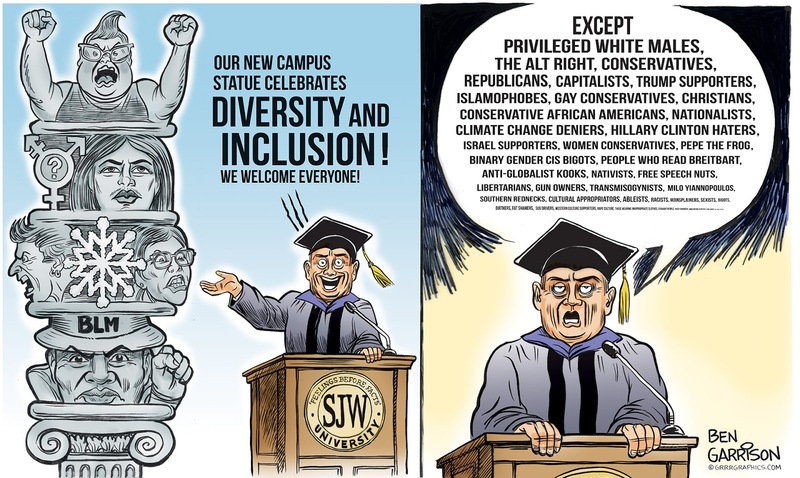 Build your own statue—maybe it could be a fist that's flipping a stiff mid digit toward those higher institutions of learning that teach political correctness and obeisance to Big Brother.